SEEING THE ONLY WISE AND merciful God in these latter days hath poured out so richly His mercy and goodness to mankind, whereby we do attain more and more to the perfect knowledge of His Son Jesus Christ and of Nature, that justly we may boast of the happy time wherein there is not only discovered unto us the half part of the world, which was hitherto unknown and hidden, but He hath also made manifest unto us many wonderful and never-heretofore seen works and creatures of Nature, and, moreover, hath raised men, indued with great wisdom, which might partly renew and reduce all arts (in this our spotted and imperfect age) to perfection, so that man might thereby understand his own nobleness and worth, and why he is called Microcosmus, and how far his knowledge extendeth in Nature. Although the rude world herewith will be but little pleased, but rather smile and scoff thereat; also the pride and covetousness of the learned is so great, it will not suffer them to agree together; but were they united, they might out of all those things which in our age God doth so richly bestow on us, collect Librum Naturae, or, a Perfect Method of all Arts. But such is their opposition that they still keep, and ate loath to leave, the old course, esteeming Porphyry, Aristotle, and Galen, yea, and that which hath but a mere show of learning, more than the clear and manifested Light and Truth. Those, if they were now living, with much joy would leave their erroneous doctrines; but, here is too much weakness for such a great work. And although in Theology, Medicine and Mathematics, the truth doth oppose itself, nevertheless, the old Enemy, by his subtlety and craft, doth show himself in hindering every gold purpose by his instruments and contentious, wavering people. To such an intention of a general reformation, the most godly and highly illuminated Father, our Brother, C.R.C., a German, the chief and original of our Fraternity, hath much and long time laboured, who, by reason of his poverty (although descended of noble parents), in the fifth year of his age was placed in a cloister, where he had learned indifferently the Greek and Latin tongues, and (upon his own earnest desire and request), being yet in his growing years, was associated to a Brother, P.A.L., who had determined to go to the Holy Land. Although this Brother died in Cyprus, and so never came to Jerusalem, yet our Brother C.R.C. did not return, but shipped himself over, and went to Damascus, minding from thence to go to Jerusalem. But by reason of the feebleness of his body he remained still there, and by his skill in medicine he obtained much favour with the Turks, and in the meantime he became acquainted with the Wise Men of Damcar in Arabia, and beheld the great wonders they wrought, and how Nature was discovered unto them. Hereby was that high and noble spirit of Brother C.R.C. so stirred up, that Jerusalem was not so much now in his mind as Damcar; also he could not bridle his desires any longer, but made a bargain with the Arabians that they should carry him for a certain sum of money to Damcar. showed him other secrets out of his cloister, whereat he could not but mightily wonder. 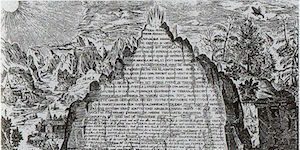 He learned there better the Arabian tongue, so that the year following he translated the Book M (Liber Mundi) into good Latin, which he afterwards brought with him. This is the place where he did learn his Medicine and his Mathematics, whereat the world hath much cause to rejoice, if there were more love and less envy. It is a great shame unto us that wise men, so far remote the one from the other, should not only be of one opinion, hating all contentious writings, but also be so willing and ready, under the seal of secrecy, to impart their secrets to others. Every year the Arabians and Africans do send to one another, inquiring of one another out of their arts, if haply they had found out some better things, or if experience had weakened their reasons. Yearly there came something to light whereby the Mathematics, Medicine, and Magic (for in those are they of Fez most skillful) were amended. There is nowadays no want of learned men in Germany. Magicians, Cabalists, Physicians and Philosophers were there but more love and kindness among them, or that the most part of them would not keep their secrets close only to themselves. At Fez he did get acquaintance with those which are commonly called the Elementary inhabitants, who revealed unto him many of their secrets, as we Germans likewise might gather together many things if there were the like unity and desire of searching out secrets amongst us. Of those at Fez he often did confess, that their Magic was not altogether pure, and also that their Cabala was defiled with their Religion; but, notwithstanding, he knew how to make good use of the same, and found still more better grounds for this faith, altogether agreeable with the harmony of the. whole world, and wonderfully impressed in all periods of time. Thence proceedeth that fair Concord, that as in every several kernel is contained a whole good tree and Emit, so likewise is included in the little body of man, the whole great world, whose religion, policy, health, members, nature, language, words, and works, are agreeing, sympathizing, and in equal tune and melody with God, Heaven, and Earth; and that which is disagreeing with them is error, falsehood, and of the devil, who alone is the first, middle, and last cause of strife, blindness, and darkness in the world. Also, might one examine all and several persons upon the earth, he should find that which is good and right is-always agreeing within itself, but all the rest is spotted with a thousand. erroneous conceits. restored. But it was to them a laughing matter, and being a new thing unto them, they feared that their great name would be lessened if they should now again begin to learn, and acknowledge their many years’ errors, to which they were accustomed, and wherewith they had gained them enough. Whoso loveth unquietness, let him be reformed (they said). The same song was also sung to him by other nations, the which moved him the more because it happened to him contrary to his expectation, being then ready bountifully to impart all his arts and secrets to the learned, if they would have but undertaken to write the true and infallible Axiomata, out of all the faculties, sciences, and arts, and whole nature, as that which he knew would direct them, like a globe or circle, to the only middle point and centrum, and (as it is usual among the Arabians) it should only serve to the wise and learned for a rule, that also there might be a society in Europe which might have gold, silver, and precious stones, sufficient for to bestow them on kings for their necessary uses and lawful purposes, with which society such as be governors might be brought up for to learn all that which God hath suffered men to know, and thereby be enabled in all times of need to give their counsel unto those that seek it like the Heathen Oracles. Such a one likewise hath Theophrastus been in vocation and callings, although he was none of our Fraternity, yet, nevertheless hath he diligently read over the Book M, whereby his sharp ingenium was exalted; but this man was also hindered in his course by the multitude of the learned and wise-seeming men, that he was never able peaceably to confer with others of the knowledge and understanding he had of Nature. And therefore in his writings he rather mocked these busybodies, and doth not altogether show them what he was; yet, nevertheless, there is found in him well grounded the aforementioned Harmonia, which without doubt he had imparted to the learned, if he had not found them rather worthy of subtle vexation than to be instructed in greater arts and sciences. He thus with a free and careless life lost his time, and left unto the world their foolish pleasures. But that we do not forget our loving Father, Brother R.C., he after many painful travels, and his fruitless true instructions, returned again into Germany, which he heartily loved, by reason of the alterations which were shortly to come, and of the strange and dangerous contentions. There, though he could have bragged with his art, but especially of the transmutations of metals, yet did he esteem more Heaven, and men, the citizens thereof, than all vainglory and pomp. Nevertheless, he builded a fitting and neat habitation, in the which ruminated his voyage and philosophy, and reduced them together in a true memorial. In this house he spent a great time in the mathematics, and made many fine instruments, ex omnibus hujus artis partibus, whereof there is but little remaining to us, as hereafter you shall understand. bare a great affection) three of his brethren, Brother G.V., Brother I.A., and Brother I.O., who had some more knowledge of the arts than at that time many others had. He did bind those three unto himself, to be faithful, diligent, and secret, as also to commit carefully to writing all that which he should direct and instruct them in, to the end that those. which were to come, and through especial revelation should be received into this Fraternity, might not be deceived in the least syllable and word. After this manner began the Fraternity of the Rosy Cross – first by four persons only, and by them was made the magical language and writing, with a large dictionary, which we yet daily use to God’s praise and glory, and do find great wisdom therein. They made also the first part of the Book M, but in respect that that labour was too heavy, and the unspeakable concourse of the sick hindered them, and also while his new building (called Sancti Spiritus) was now finished, they concluded to draw and receive yet others more into their Fraternity. To this end was chosen Brother R.C., his deceased father’s brother’s son; Brother B., a skillful painter; C.G. ; and P.D., their secretary, all Germans except IA., so in all they were eight in number, all bachelors and of vowed virginity, by whom was collected a book or volume of all that which man can desire, wish, or hope for. Although we do now freely confess that the world is much amended within an hundred years, yet we are assured that our Axiomata shall immovably remain unto the world’s end, and. also the world in her highest and last age shall not attain to see anything else; for our Rota takes her beginning from that day when God spake Fiat and shall end when He shall speak Pereat; yet God’s clock striketh every minute, where ours scarce striketh perfect hours. We also steadfastly believe, that if our Brethren and Fathers had lived in this our present and clear light they would more roughly have handled the Pope, Mahomet, scribes, artists, and sophisters, and showed themselves more helpful, not simply with sighs and wishing of their end and consummation. When now these eight Brethren had disposed and ordered all things in such manner as there was not now any need of any great labour, and also that every one was sufficiently instructed and able perfectly to discourse of secret and manifest philosophy, they would not remain any longer together, but, as in the beginning they had agreed, they separated themselves into several countries, because that not only their Axiomata might in secret be more profoundly examined by the learned, but that they themselves, if in some country or other they observed anything, or perceived some error, they might inform one another of it. These six articles they bound themselves one to another to keep; five of the Brethren departed, only the Brethren B. and D. remained with the Father, Brother. R.C., a whole year. When these likewise departed, then remained by him his cousin and Brother I.O., 50 he hath all the days of his life with him two of his Brethren. And although as yet the Church was not cleansed, nevertheless, we know that they did think of her, and what with longing desire they looked for. Every year they assembled together with joy, and made a full resolution of that which they had done. There must certainly have been great pleasure to hear truly and without invention related and rehearsed all the wonders which God hath poured out here and there throughout the world. Every one may hold it out for certain, that such persons as were sent, and joined together by God and the Heavens, and chosen out of the wisest of men as have lived in many ages, did live together above all others in highest unity, greatest secrecy, and most kindness one towards another. After such a most laudable sort they did spend their lives, but although they were free from all diseases and pain, yet, notwithstanding, they could not live and pass their time appointed by God. The first of this Fraternity which died, and that in England, was I.O., as Brother C. long before had foretold him; he was very expert, and well learned in Cabala, as his Book H witnesseth. In England he is much spoken of, and chiefly because he cured a young Earl of Norfolk of the leprosy. They had concluded, that, as much as possibly could be, their burial place should be kept secret, as at this day it is not known unto us what is become of some of them, yet everyone’s place was supplied with a fit successor. But this we will confess publicly by these presents, to the honour of God, that what secret soever we have learned out of the Book M, although before our eyes we behold the image and pattern of all the world, yet are there not shewn unto us our misfortunes-, nor hour of death, the which is known only to God Himself, Who thereby would have us keep in continual readiness. 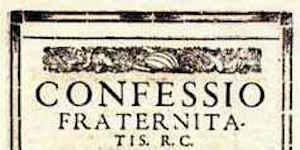 But hereof more in our Confession, where we do set down thirty-seven reasons wherefore we now do make known our Fraternity, and proffer such high mysteries freely, without constraint or reward. Also we do promise more gold than both the Indies can bring to the King of Spain, for Europe is with child, and shall bring forth a strong child, who shall stand in need of a great godfather’s gift. After the death of I.O., Brother R.C. rested not, but, as soon as he could, called the rest together, and then, as we suppose, his grave was made, although hitherto we (who were the latest) did not know when our loving Father R.C. died, and had no more but the bare names of the beginners, and all their successors to us. Yet there came into our memory a secret, which, through dark and hidden words and speeches of the hundred years, Brother A., the successor of D. (who was of the last and second row of succession, and had lived amongst many of us), did impart unto us of the third row and succession; otherwise we must confess, that after the death of the said A., none of us had in any manner known anything of Brother C.R., and of his first fellow-brethren, than that which was extant of them in our philosophical Bibliotheca, amongst which our Axiomata was held for the chiefest, Rota Mundi for the most artificial, and Protheus for the most profitable. Likewise, we do not certainly know if these of the second row have been of like wisdom as the first, and if they were admitted to all things. answered discreetly and Christian-like, we will not be ashamed to set forth publicly in print our names and surnames, our meetings, or anything else that may be required at our hands. with the year of the Lord under it. Therefore we gave God thanks, and let it rest that same night, because first we would overlook our Rota-but we refer ourselves again to the Confession, for what we here publish is done for the help of those that are worthy, but to the unworthy, God willing, it will be small profit. For like as our door was after so many years wonderfully discovered, also there shall be opened a door to Europe (when the wall is removed), which doth already begin to appear, and with great desire is expected of many. 1. Nequaquam Vacuum. 2. Legis Jugum. This is all clear and bright, as also the seventh side and the two heptagons. So we kneeled down altogether, and gave thanks to the sole wise, sole mighty, and sole eternal God, who hath taught us more than all men’s wits could have found out, praised be His Holy Name. This vault we parted into three parts, the upper part or ceiling, the wall or side, the ground or floor. 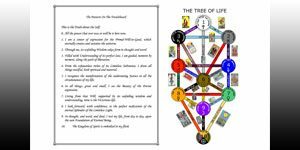 Of the upper part you shall understand no more at this time but that it was divided according to the seven sides in the triangle which was in the bright center; but what therein is contained you (that are desirous of our Society) shall, God willing, behold the same with your own eyes. Every side or wall is parted into ten squares, every one with their several figures and sentences, as they are truly shewn and set forth concentratum here in our book. The bottom again is parted in the triangle, but because therein is described the power and rule of the Inferior Governors, we leave to manifest the same, for fear of the abuse by the evil and ungodly world. But those that are provided and stored with the Heavenly Antidote, do without fear or hurt, tread on and bruise the head of the old and evil serpent which this our age is well fitted for. Every side or wall had a door for a chest, wherein there lay divers things, especially all our books, which otherwise we had, besides the Vocabulario of Theophrastus Paracelsus of Hohenheim, and these which daily unfalsifieth we do participate. Herein also we found his Itinerarium and Vita, whence this relation for the most part is taken. In another chest were looking-glasses of divers virtues, as also in other places were little bells, burning lamps, and chiefly wonderful artificial songs; generally all was done to that end, that if it should happen, after many hundred years, the Fraternity should come to nothing, they might by this only vault be restored again. Now, as yet we had not seen the dead body of our careful and wise Father, we therefore removed the altar aside; then we lifted up a strong plate of brass, and found a fair and worthy body; whole and unconsumed, as the same is here lively counterfeited, with all the ornaments and attires. In his hand he held a parchment called 77, the which next unto the Bible is our greatest treasure, which ought not to be delivered to the censure of the world. At the end of this book standeth this following Elogium. C.R.C. ex nobili atque splendida Germaniae R.C. familia oriundus, vir sui seculi divinis revelationibus, subtilissimis imaginationibus, indefessis laboribus ad coelestia atque humana mysteria; arcanave admissus postquam suam (quam Arabico et Africano itineribus collejerat) plus quam regiam, atque imperatonam Gazam suo seculo nondum convenientem, posteritati eruendam costodivisset et jam suarum Artium, Ut et nominis, fides ac conjunctissimos heredes instituisset mundum minutum omnibus motibus magno illi respondentem Fabricasset hocque tandem preteritarum, praesentium, et futurarum, rerum compendio extracto, centenario major, non morbo (quem ipse nunquam corpore expertus erat, nunquam alio infestare sinebat) ullo pellente sed Spiritis Dei evocante, illuminatum animam (inter Fratrum amplexus et ultima oscula) fidelissimo Creatori Deo reddidisset, Pater delicitissimus, Frater suavissimus, praeceptor fidelissimus, amicus integerimus, a suis ad 12 annos hic absconditus est. 1. Fra. I.A. Fra. C.H. electione Fraternitatis caput. 2. Fra. G.V.M.P.C. At that time was already dead Brother I.O. and Brother P.D., but their burial place, where is it to be found? We doubt not but our Era. Senior hath the same, and some special thing laid in earth, and perhaps hidden, like our Father C. We also hope that. this our example will stir up others more diligently to enquire after their flames (which we have therefore published), and to search for the place of their burial; the most part of them, by reason of their practice and medicine, are yet known and praised among very old folks; so might perhaps our Gaza be enlarged, or, at least, be better cleared. Concerning Minutum Mundum we found it kept in another little altar, truly more finer than can be imagined by any understanding man, but we will leave him undescribed until we shall be truly answered upon this our true-hearted Fama. So we have covered it again with the plates, and set the altar thereon, shut the door and made ft sure with all our seals. Moreover, by instruction, and command of our Rota, there are come to sight some books, among which is contained M (which were made instead of household care by the praiseworthy M.P.). Finally, we departed one from the other, and left the natural heirs in possession of our jewels. And so we do expect the answer and judgment of the learned and unlearned. Howbeit we know after a time there will now be a general reformation, both of divine and human things, according to our desire and the expectation of others; for it is fitting, that before the rising of the Sun there should appear and break forth Aurora, or some clearness, or divine light in the sky. And so, in the meantime, some few, which shall give their names, may join together, thereby to increase the number and respect of our Fraternity, and make a happy and wished for beginning of our Philosophical Canons, prescribed to us by our Brother R.C., and be partakers with us of our treasures (which never can fail or be wasted) in all humility and love, to be eased of this world’s labours, and not walk so blindly in the knowledge of the wonderful works of God. Churches’ ornament and the honour of the Temple. Our Philosophy also is not a new invention, but as Adam after his fall hath received it, and as Moses and Solomon used it, also it ought not much be doubted of, or contradicted by other opinions, or meanings; but seeing the truth is peaceable, brief, and always like herself in all things, and especially accorded with by Jesus in omnia parte and all members, and as He is the true image of the Father, so is she His image, so it shall not be said, This is true to Philosophy, but true according to Theology; and wherein Plato, Aristotle, Pythagoras, and others did hit the mark, and wherein Enoch, Abraham, Moses, Solomon, did excel, but especially wherewith that wonderful book the Bible agreeth. All that same concurreth together, and maketh a sphere or globe whose total parts are equidistant from the center, as hereof more at large and more plain shall be spoken in Christianly Conference. But now concerning, and chiefly in this our age, the ungodly and accursed gold-making, which hath gotten so much the upper hand, whereby under colour of it, many runagates and roguish people do use great villainies, and cozen and abuse the credit which is given them; yea, nowadays men of discretion do hold the transmutation of metals to be the highest point and fastigium in philosophy. This is all their intent and desire, and that God would be more esteemed by them and honoured which could make great store of gold, the which with unpremeditate prayers they hope to obtain of the all-knowing God and searcher of all hearts; but we by these presents publicly testify, that the true philosophers are far of another mind, esteeming little the making of gold, which is but a parergon for besides that they have a thousand better things. We say with our loving rather C.R.C., Phy. aurum nisi quantum aurum, for unto him the whole nature is detected; he doth not rejoice that he can make gold, and that, as saith Christ, the devils are obedient unto him, but is glad that he seeth the Heavens open, the angels of God ascending and descending, and his name written in the book of life (in den Boecke des Levens). Also we testify that, under the name of Chymia, many books and pictures are set forth in Contumeliam gloriae Dei, as we will name them in their due season, and will give to the pure-hearted a catalogue or register of them. We pray all learned men to take heed of this kind of books; for the Enemy never resteth, but soweth his weeds till a stronger one doth root them out. So, according to the will and meaning of Fra. C.R.C., we his brethren request again all the learned in Europe who shall read (sent forth in five languages) this our Fama and Confessio, that it would please them with good deliberation to ponder this our offer, and to examine most nearly and sharply their arts, and behold the present time with all diligence, and to declare their mind, either communicatio consilio, or singulatim by print. And although at this time we make no mention either of our names or meetings, yet nevertheless everyone’s opinion shall surely come to our hands, in what language so ever it be, nor anybody shall fail, whoso gives but his name, to speak with some of us, either by word of mouth, or else, if there be some let, in writing. And this we say for a truth, that whosoever shall earnestly, and from his heart, bear affection unto us, it shall be beneficial to him in goods, body, and soul; but he that is false-hearted, or only greedy of riches, the same first of all shall not be able in any manner of wise to hurt us, but bring himself to utter ruin and destruction. Also our building, although one hundred thousand people had very near seen and beheld the same, shall forever remain untouched, undestroyed, and hidden to the wicked world.